The Rogue’s gallery gets a little bigger in 2017 with the addition of hybrid models to Nissan’s lineup of compact crossover sport-utility vehicles. The prospect of improved fuel economy from the gasoline-and-electric powerplant comes with a limit on passenger capacity. Rogue hybrids are available in SV and tonier SL trim, and with the choice of front- or all-wheel drive. 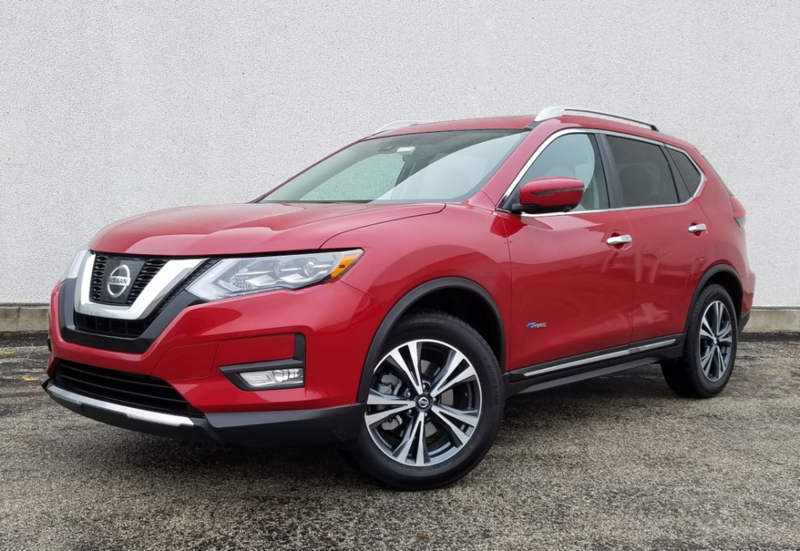 Gas-engine Rogues can seat up to seven with optional third-row seating that’s extremely rare in the compact-SUV segment. However, the hybrids are restricted to 5-place seating. Hybrid Rogues are available in midlevel SV, and topline SL trim levles. Both are available with AWD. 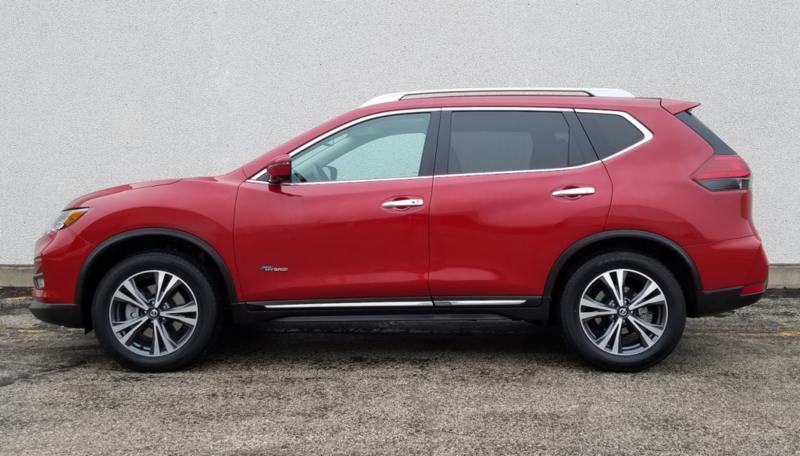 Hybrid hardware adds a couple of hundred pounds to the Rogue, but it is the most powerful configuration: The 2.0-liter 4-cylinder gas engine and 30-kilowatt electric motor team up to deliver a peak 176 horsepower, six more ponies than a 2.5-liter four makes in all-gas applications. Fully electric driving is the norm at low speeds but once drivers get out of school-zone conditions—i.e. the vast majority of places to drive—the gas engine is going to be carrying the freight. A telltale light blinks “EV” in the tachometer dial when the juice is flowing but based on this driver’s experience in the SL AWD Hybrid that Consumer Guide® tested, those episodes come and go quickly. The Rogue cabin is roomy and well appointed. Second-row legroom is better than in most vehicles in this class. The Rogue Hybrid can keep up a decent pace on the expressway and is well served by the standard continuously variable transmission (not all CVTs are as cooperative). Getting off from a standstill, however, requires what feels like a couple inches of pedal travel before the message gets through to the vehicle that you want to go. (Note that even in the Hybrid there is a “Sport” mode to keep the revs up a little longer, and an “Eco” setting for added economy.) EPA mileage ratings with all-wheel drive come in at 31 mpg city, 34 mpg highway, and 33 mpg combined. In a January cold snap (which can diminish battery strength), this reviewer averaged 29.58 mpg after a stint of 100.1 miles that was made up of 64 percent city-style driving. There’s something of an odd disconnect in going from the gas pedal to the brake. While the former takes up some slack before going into action, the latter seems to get about its job right away but it still takes a full push to the floor to really get stopped. Otherwise, handling is as easy and ride as generally comfortable as in other Rogues CG has driven in recent years. In Hybrid models, Rogue’s cargo floor is slightly elevated, though storage space is still plentiful. Because the hybrid battery is located aft of the 2nd-row seats, 3rd-row seating is not available on hybrid models. The test vehicle displayed 2017’s styling facelift (Nissan’s “V-Motion” grille and other exterior tweaks). 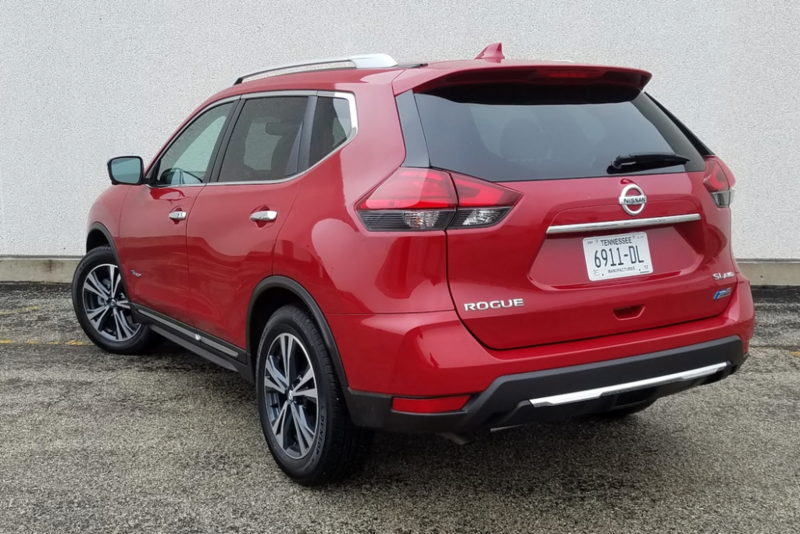 Also in place were the newly available heated steering wheel, driver-seat memory, hands-free power liftgate, automatic high-beam headlights, and lane-departure warning and mitigation with rear cross-traffic alert. 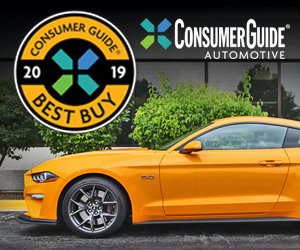 Other key SL Hybrid standards include leather upholstery, heated front seats, satellite radio, navigation system with voice recognition, 360-degree “Around View Monitor” camera, and NissanConnect Apps including Facebook, iHeartRadio, and Pandora. Toyota’s RAV4 is the only other compact crossover currently available in hybrid form. Big analog gauges greet the driver, with a legible vehicle-information display between them. Controls for the standard dual-zone climate system are a mix of dials for temperature and push buttons for other functions. 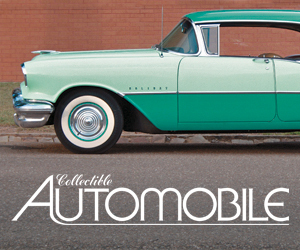 Audio settings are easily accessed and operated through the 7-inch color touchscreen. There’s a nice look and feel to the cabin in the high-end models. Padded soft-touch surfaces are on all four armrests, and there’s give to the dash pad and the tops of the front doors. Rear doors, however, feature molded-plastic panels. This driver had little trouble finding a natural and comfortable spot behind the wheel (though he needed an oddly high lift to reach the brake pedal). Headroom was good, even under the optional panoramic moonroof. The moonroof does limit rear-seat headroom a little bit but six-footers will still fit. Rear-seat legroom isn’t bad for a compact vehicle, and three adults can squeeze across the seat, aided by a very low driveline tunnel. Even with AWD step-in height is not complicated. However, rear-corner vision is crimped by rising quarter panels that cut down on window space. Personal-item storage is handled by a large glove box, a moderately sized console cubby with an electric power point, two open cup holders in the console, and a couple of shallow bins, including one under the dash with a USB port and another power plug-in. For the benefit of rear passengers there are pouches in the back of the front seats, plus a pull-down center armrest with two cup holders. All doors have pockets with bottle holders in them, though those in the rear are barely larger than the diameter of a bottle. Two-row Rogues have a “Divide-N-Hide” cargo system with movable floor panels that can be slotted in at different heights to reconfigure the fairly ample cargo hold, and create hidden storage spaces. Second-row seats fold in a 60/40 split. While the seat backs don’t rest completely flat, a flipper panel makes an uninterrupted platform with the rest of the cargo floor. If there’s any fault with the Divide-N-Hide panels it’s that they raise the load floor about an inch above bumper height. The added expense of hybrids is a tough sell when gas prices are low, as they have been. But for people who really want this feature in a compact SUV the limited choices just grew a little bigger with the Rogue. Consumer Guide’s observed 29.4 mpg came during an extreme Chicago winter cold snap. Because cold weather can affect battery performance, it’s likely we didn’t observe the Rogue Hybrid at its efficient best. Written by: The Daily Drive staff on February 17, 2017.on March 22, 2019.